This is a T intersection with tram rail cutting through. In the Netherlands bike lanes are usually paved with red color as an indicator of its existence. To ensure the priority at intersections both yield sign and yield marking (shark teeth shaped) is applied. 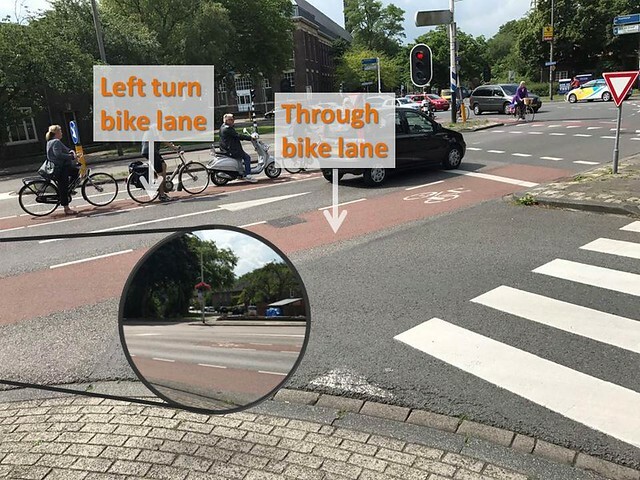 There are two bike lanes on the same leg of the intersection which carries bike towards different directions. To guide the cyclist the right side of lane marking extended into the intersection. In this intersection, bikes from the north are divided into two separate bike lanes, one for the left turning bikes and one for the through traffic. 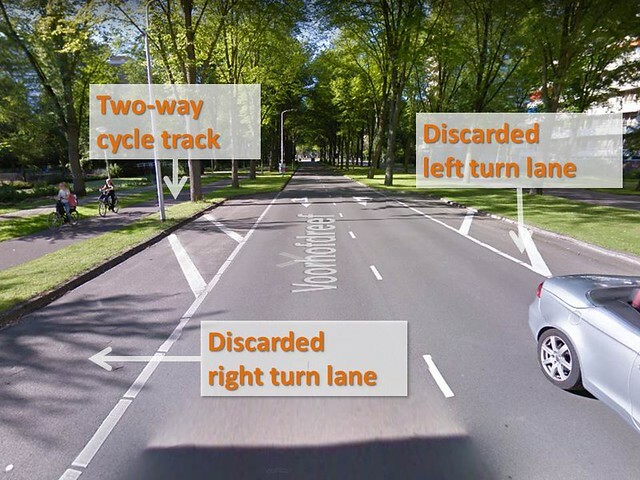 This design eliminated the conflict between left turning bikes and cars going straight up, which usually occurs when bike lane is put to the right side of the road. 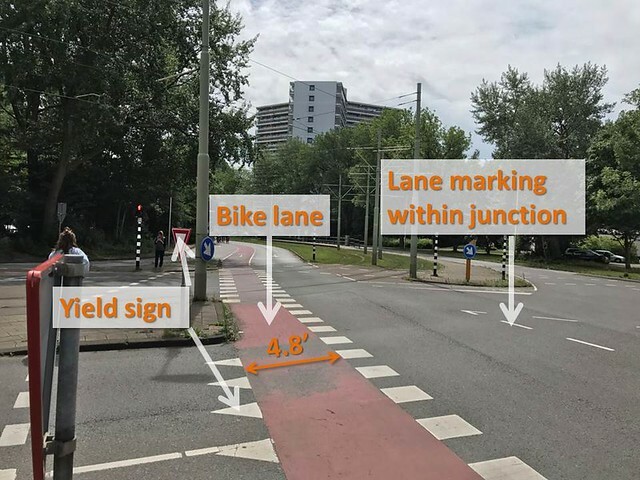 In fact the conflict point is pushed backwards to the upper stream of the traffic, where drivers and cyclists have more space to shift between lanes and are not yet paying too much attention to the intersection. This bike boulevard connects the TU Delft campus with the commercial area. 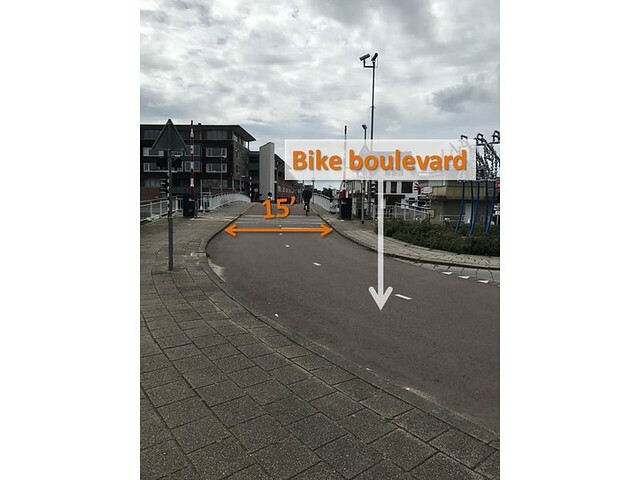 The pavement is all read indicates this is a road for bikes and the width of each direction is enough for cyclists to ride side by side. This bike boulevard is located on the south bund of the canal. Other than asphalt, brick is used as the pavement to offer a different texture to tell the driver he’s entering a low speed road section. Speed hump is placed to lower the speed, thus ensure safety of bikes. Despite this road section is one-way for motorized vehicles, bikes are allowed to ride both ways. Cycle track is placed to the east side of the road where there’re lots of commercials. 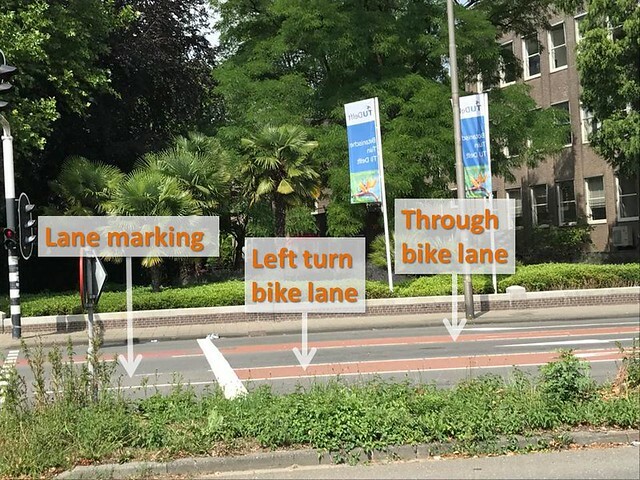 A two-way cycle track helps means cyclists won’t have to cross the street, which is rather wide thus hard to cross, to go other direction. This is a road connecting to an expressway. During peak hr this road is sometimes congested. 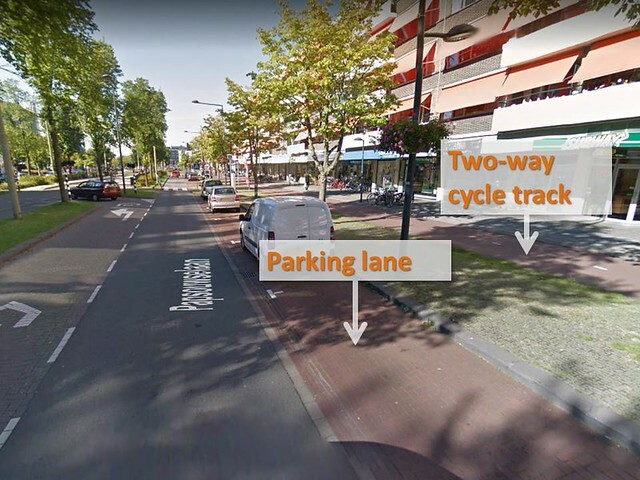 Two-way cycle track is built on both way of the road. To makes pedestrian crossing safer the left turn lane and the right turn lane is not used. Therefore pedestrians won’t have to cross 4 lanes at a time. 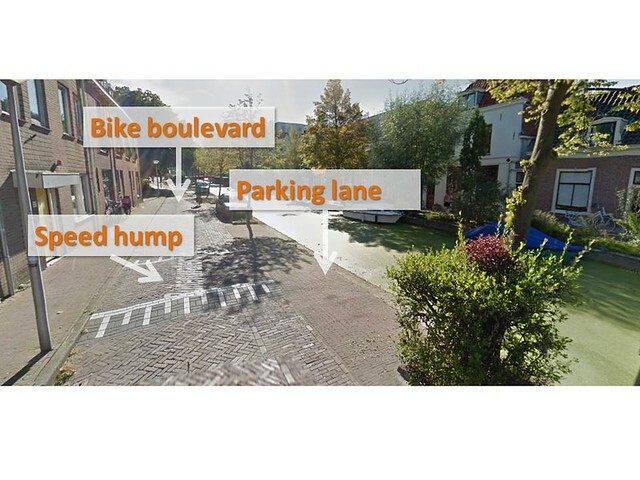 This road within residential area has one-way cycle track on each side, separated by parked cars. 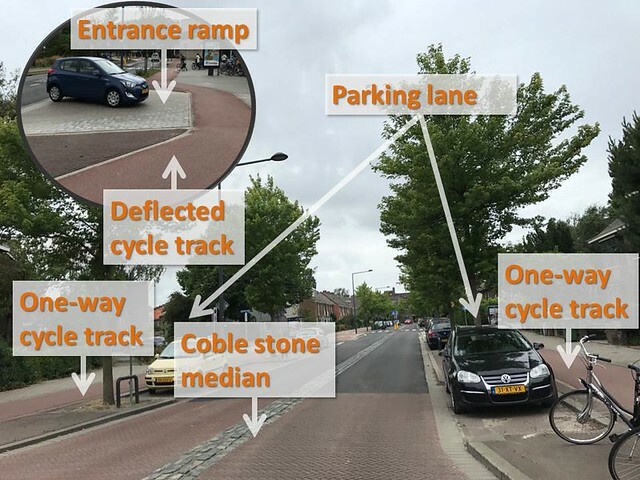 Cycle tracks are raised to the same level of side walk. The median helps driver to notice when he’s moving across the center. When there’s an entrance ramp, cycle track is deflected to provide entering drivers a better vision. 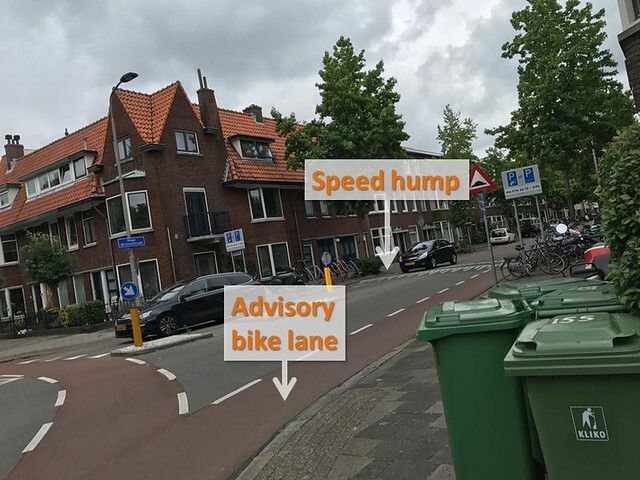 An advisory bike lane is marked usually when the road has limited width. The center area is for motor vehicle. 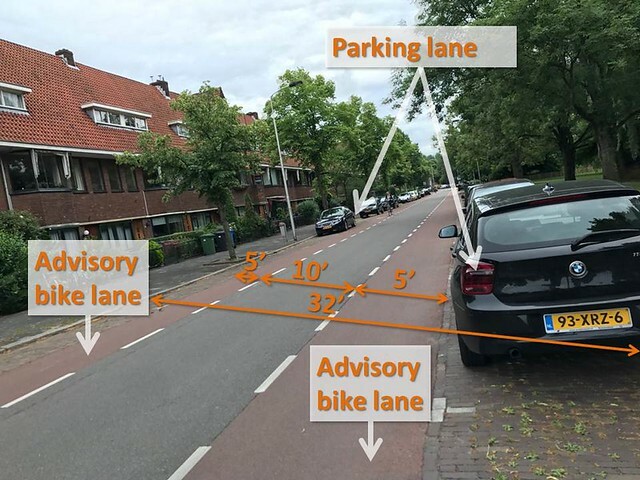 When two cars meet they are allowed to enter the advisory bike lane to make way for each other. Advisory lanes provide reasonable separation for bikers when there isn’t too much motorized traffic on the road. What wasn’t shown in this picture is that there’s a section of this road where there is a school. To ensure safety of kids the section is made 30 kph while other is 50. This is done by changing pavement and speed hump, as well as narrowing the center area of the road. This road has a “classic” 5+10+5 striping, which 5 ft is desirable width for bike lanes with parking on the side and 10 ft for cars. This is a rural road. Usually there’s not much traffic on a rural road. Riding on this road is really pleasant. 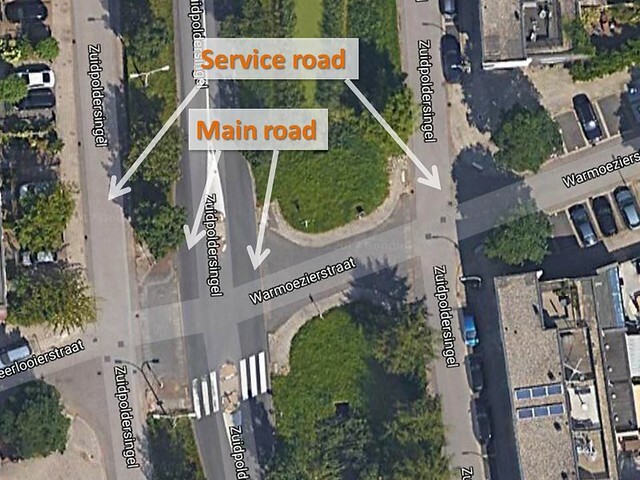 Service road is road aligned with the main road while having the function of letting vehicles get in and out surrounding facilities. It usually has a lower speed and volume compared to the main road. 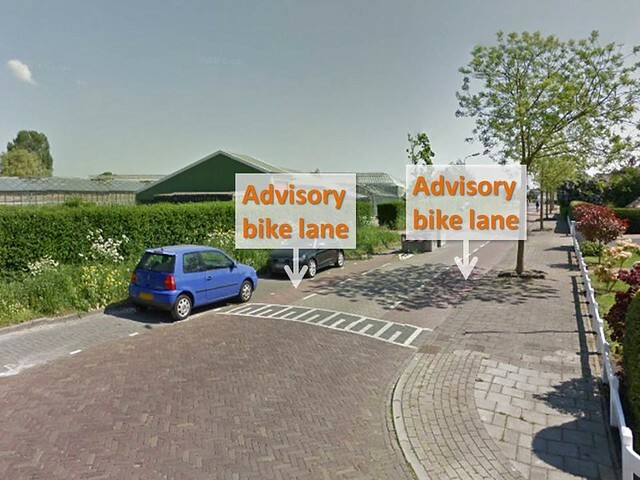 Therefore, it’s possible for bikes to ride on it without taking too much risk. 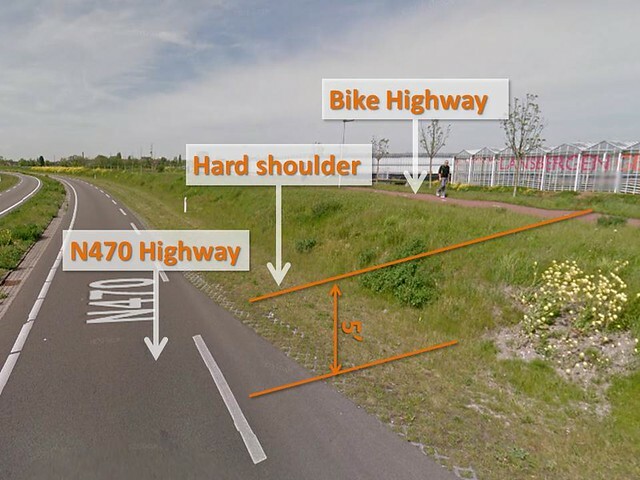 The bike highway is built along the N470 highway, providing bikers with straight route connecting two cities. The separation is made by the difference of height. On the highway, the road is shrunk into one lane per direction to avoid passing. This as a result controls the speed of vehicles. The hard shoulder is paved with grass planting bricks to create this one-lane view.